And, I think what Ryan is doing has really blessed a lot of people around the world. I’m so excited to have him today with us. So, with that, let me introduce to you Ryan Hreljac. And, Ryan, if you don’t mind, maybe you could just tell our audience a little bit about you, and what you’re doing and your background, so that they can get to know you a little bit on a more personal level. Ryan: Yeah, absolutely. Thanks for having me on, Rob. My name is Ryan Hreljac. I grew up in a small town outside of Ottawa, Canada’s capital. And, I guess, the easiest way to put it is, when I was a kid when I was six years old, I started volunteering. I became engaged in a school project to fundraise money for clean water projects. And the easiest way to say it is that it never really stopped, and it became a part of my life, and it became something that really meant a lot to me. And it was able to get to the point where what started out as something that was very naive, and something that may not have done anything ended up building a well and then doing so much more. And then it got to the point where it created a foundation called the Ryan’s Well Foundation, and that’s been around for 16 years now. And we’ve been able to do over 1,000 water projects all over the world, helping almost a million people get access to clean water. So, I guess my story is that you’re never too young to make a difference, and you never know what will make a difference sometimes. Rob: Yeah, tell us a little bit about that, Ryan. So, I mean, it’s…and, I think, you just totally undersold yourself, I mean, as far as what you’ve done is amazing. You brought clean water to over a million people now at this point. What he didn’t mention is that he was on Oprah. I mean, he’s been on different shows. I asked him where he’s been recently, and he’s been in Singapore, Uganda, different places, and…so what you’re doing is really amazing, and clearly just a very humble person, which speaks volumes to you. And maybe just expand a little bit on this, how it came about from that age. What happened there? Ryan: Well, knowing more about it, I think, it’s easier to understand why it’s easy to be humble about it, because when I was a kid, my teacher tried to explain to us a complicated issue, that there are people in the world that didn’t have access to clean water, and we didn’t understand. We were like, “Why don’t they have water fountains?” and things six-year-olds ask teachers. And my teacher really had to take the time to explain to us, like, “No, not everyone has water. Sometimes kids your age have to walk as far as five kilometers,” which we did not understand. So my teacher tried to explain it to us by saying “That’s about 5,000 steps,” which didn’t help either, but it got me thinking. So I took the steps it took me to get from my classroom to the water fountain, and I counted ten. So, you know, when you’re a kid, I guess, one thing that was stressed to me a lot was this concept of sharing, that things were fair in the classroom. And to hear that it wasn’t, really, around the world, and that there were kids who couldn’t even go to school because they had to spend their days getting water, it upset me because I, you know, was led to believe that, you know, if you wanted to work hard and go to school and, you know, try to succeed, then you could. Rob: Which I love that, by the way. Ryan: Yeah, to do additional chores of the things I already did. So I already had to do six-year-old things like making my bed, clear the table. Now I was told I had to wash windows, vacuum, shovel snow, and all these things I didn’t do before and in exchange, I got an allowance at the end of each week. And it took a long time. Actually, it was a school project. It was supposed to last for 40 days. And by the time 40 days had gone by, I had only raised $25, and my goal would have been 70. So, I actually failed. And I think both my parents were concerned, and, kind of, did a little facepalm because, you know, they’re grown-ups they understood that you couldn’t have that kind of impact even if you had the sincerest of intentions and worked the absolute hardest you could. I was a kid. So, I think they tried to let me down a really easy way, saying like, “You know what? You tried really hard. You did a good work, but, you know, it’s okay to stop.” And I think the things that really underlined that is that I wasn’t a special go-getter kid. I was, you know, when it got to the weekends, I wanted to go home and play video games with my brothers, and sleep in. I just wasn’t that, kind of, student. So, I think, they were a little bit perplexed, but it was something that just really meant a lot to me. And, I think, I started bringing it to my neighborhood and in my class, and I think people were, especially my peers and my classmates, they were half surprised and half challenged, saying, “You know if Ryan can do this, why can’t I do something about it?” And I think that started a tipping point where it became less of my project, and more of my class’s project, and then my community’s project. And now, where we are today, all around the world. I think, one of the only reasons why we’ve been able to do so much hasn’t been because I was anything special or out-of-the-ordinary, but because it was a message that you don’t have to be someone that important. You don’t have to be that go-getter, that activist, that saint to make a big difference in the world. You can be a kid in grade 1. And that’s led to all the work we’ve been able to do to this day. Rob: Man, that is fabulous. My mind is just racing with ideas. I mean, you think about all the lessons that could be learned by adults and by us and leaders and organizations. Number one, you had a vision. Even in elementary school, the power of having a vision and how you rally people around your vision. And ironically, even as well-intentioned as many of us are, as parents or friends, or even co-workers or supervisors, how often do we unknowingly stop someone from doing something that they could have done? You know, like your parents. “Yeah right, you wanna do this.” But then, they saw that you were serious about it, and the impact and people started rallying towards you, and it became theirs as others grasped onto your vision. Ryan: Hmm. No, I think a really important thing is, I may have had a lofty goal. Like, my goal when I came home that day was, “I want to bring clean water to everyone in the world,” but on my teacher sheet, it said $70 would buy a well. So, my mom, when they, I finally convinced them to let me raise the money, my mom did probably the most important thing that she could have. She drew a thermometer, and she stuck it on the side of the fridge and had 2, 4, 8s, all the way up to $70, which was my goal. And every $2 I raised, they got to color in another line. And that may sound very simple, but, I think, sometimes when we’re setting goals, we can be a little bit ambiguous. We can’t set too high or too lofty, or we don’t have a clear idea what success looks like, and that’s been important, that was incredibly important for me for not giving up. And still today, every year we set our self-new goals, what success looks like, what do we want to achieve. And I think that’s very important when you talk about, you know, trying to change the world, even if it’s a little bit. Rob: Oh, people respond to the thermometer. Never underestimate the thermometer. Rob: Well, hey, what I’d love for our listeners to hear maybe is some of the experiences you’ve had. I mean, we really could just take the whole call on how this all just came about, because, I mean, you ended up raising 250,000 and then 750,000 and so on from there until now it has blossomed into this organization and foundation that has transformed the lives of over a million people, as you mentioned. And you’ve been back to Africa numerous different time. There’s, you know, we didn’t talk about your adopted brother, I believe, or anything like that, which is okay and that’s great. Because there’s only so much time we have, what are some of the experiences stories or lessons learned through all of these years from your trips back there to Africa, and just from this whole experience? What are some of the things that really stood out to you, some of your stories or your lessons learned? Ryan: I think, one thing that really sticks out was probably the first trip I ever took to Uganda. I would have been…that was where the very first of well was built and I would have been nine. And my neighbors, who I had ended up doing chores for to raise the money, they used to travel a lot for a living, so they gave my family air mile points, so we were actually able to go. The school there had heard that a kid, like, a student had raised the money for the well, and they were very curious and, like, surprised by this, because, you know, it was contemporary, if you’re a student, like, you sit in class, and you listen to your teachers and things like that. And they took it as a learning example to their students that you didn’t have to wait to make a difference in your community. So, they were very empowered by the idea, and they always wanted me to visit to officially open the well, so, it was this good opportunity and I was actually able to go. And I was very nervous, because I had never really been outside of Canada and the States before, and I would have been nine. I would have gone across the world and went to the school. And when I went, there was this big huge celebration there. There were over 5,000 people, there was a feast, and a festival and everyone’s just so just pumped and just, like, happy. Rob: Now, was this a celebration that was going on anyway, or was this because you were there? Ryan: …they had it, and it took me a second to reel back, and they had it because they had clean water at the school. And, you know, when I was a kid, I never, I still, I think, I don’t have a smile that lights up on my face because I can have a shower or a glass of water, so to see something that I considered so small and, you know, like, negligible, to have that much of an impact on someone’s life really gave me the motivation to keep on going. And then you hear stories like my adopted brother Jimmy, who, that’s a long story in itself, but, to sum it up at the beginning, he went to that school before and after the first well was built. But before the well was built, he used to have to get up really early in the morning to go get water for his family, because there wasn’t a water source at his home or at his school. And he used to have to do that so he had the privilege to go to school. He used to have to get up at midnight, in middle of the night, and walk over five kilometers for him to the nearest well, wait in line, fill up the canisters, come back, and then do the trip again, and then do it one more time, and then he would be allowed to go to school. And then, when the well was put in, Jimmy didn’t have to do that anymore. He could just bring the water home at the end of the day and not have to fall asleep in class. So when I think you look at water and the necessity of it, if you don’t have, how do you get clean water? You get sick and you can’t go to work, you can’t go to school, you have to spend your days going to get it. And it’s one of those simple necessities that, I think, we take for granted every day until it’s not there anymore, and I think we…that’s one of the reasons why we started Ryan’s Well and why we continue today. Ryan: Yeah, I think, when you looked at me as, particularly when I was a kid, like, and I volunteered to do the project, I remember I raised my hand saying I was gonna raise the $70. My teacher was surprised and raised her eyebrows and said, “Are you sure you want to do that, Ryan?” Because, you know, if you were to pick a person to have a substantial impact on the world, I would not have been that person you would have picked. I didn’t understand the issue. I thought one well would literally bring the world clean water. I wasn’t the top of my class. I think I was just, kind of, you know, there. And I wasn’t really a leader. So, I think it was just that initiative to, you know, I found something that I cared about. I couldn’t believe about a number of steps that took me to get to the water fountain, so I raised my hand, and I think that’s a powerful thing that you lose when you get older. You become more cynical, more logical. You look at the complexities of things and find as an excuse for inaction, to not do anything because you know how hard some the problems are we face. But, I think, it’s incredibly powerful to sometimes think, like, a six-year-old, to say, “Okay, I know how I feel about this. I’ll find the results or the way to go about this as I go, but I know how I feel,” and that’s the driving factor. And I think that’s, you know, the driving factor that still sticks with us today. It’s that same goal I had when I was just when I was a kid. Rob: You know, and isn’t their power in almost that naivety. There’s a couple of statistics that we use in our seminars that the average person has been told, “No,” or what they cannot do 148,000 times, approximately, by the time they’re 18 years old. When you think what that does for our dreams and our visions of what we think is possible, and it really puts a lot of us as adults into a box to where we say, “We can’t-do that.” Well, that’s our perception of reality, but we take away all that programming and we put the mind of a six-year-old or seven-year-old in our brain and all of a sudden, “Wait. What if we did go do that?” Whatever that is, you know what I mean? Ryan: Yeah, absolutely, I think one thing that we get drilled in is that, you know, we can’t act, or that…I guess it’s difficult because, when, you know, as I grew up with all this, it was easy to become a little bit discouraged because you saw how big the problem actually was. Like, back then it was a billion people that didn’t have access to clean water, and you grew up and you see all the complexities and layers and all the reasons why people say no. And it’s important to realize those challenges and not be ignorant, not stick your head in the sand, but at the same time, you can’t focus on that when your goal is also there. And you’re gonna fail, things aren’t gonna go right all the time. Like, I would have failed so many different fundraisers and little things and little goals that I set for myself, but at the same time, if you keep on going forward and focus on that initial why and say, “Yes.” I think that’s incredibly important. Rob: Yeah, well, and I think that, from my feeling, I mean, and I know that you don’t have a whole lot background because this is the first time we’ve actually ever talked, about the 12 principles of highly successful leaders. And it’s ironic how many of those you, without even maybe necessarily knowing it, are living and doing. I mean, talk about, one of them is to lead with a vision. The second is to manage with a plan. The twelfth is to never give up. And when you start to bring these all together, it creates a combination of excellence no matter where we’re at in life, and you see that manifest. I mean, and when you were six and seven, you didn’t even know it, but really what you had was a vision. And then, you want to work on executing your plan, and people rallied to that. And you’re right, you had, you know, there are missteps along the way, we all have that. So, that’s one of the reasons I love your story, is because it encompasses so many of those principles of success. And so what are you doing…maybe just describe now what you’re doing. What’s the current state of things over there and what’s your vision for the future now? Ryan: Well, I volunteered for Ryan’s Well for about 18 years. For me, I did a lot of different things and went to school out in eastern Canada. I did a few different jobs, and then I started working for Ryan’s Well, actually, two years ago, helping with the project work and the fund development and actually doing a lot of work on the ground, which is really amazing to be a part of. But, I guess, it’s just moving forward. Last year we had a really good year and this year we’re going to keep on going forward doing all our project work for, you know, people like Jimmy to be able to go to school. And it’s as simple as that really. So, we have to kind of start over every year, so we’re just tackling our goals, trying to fund-raise as much as we can and do as much work as we can to help achieve that goal of when I was six. Yeah. Rob: And then, when you do this…right now, where is primarily your work focused? Is it in Uganda, is it in the other parts of Africa, is it, where’s the primary bulk? Ryan: Right now, we work in Eastern Africa and Uganda, and Kenya, and we work in Ghana, Burkina Faso, and Togo, and western Uganda, and we do a lot of work in Haiti. Why we work where we work is because of we have the best on-the-ground local partners there and were able to very well micromanage our projects, so we are accountable for every little thing. And which is really important for us because we may be a small organization, but one of the reasons why we’ve been able to stick around over the last 16 years is because that’s been our focus. We wanted to make sure that every penny that we fundraised went towards where it needed to be, and that was kind of the idea behind it, that, you know, let’s just, like, get things done, and that’s what we’ve been able to do. So, those are our countries of focus because we’re able to do the best work, we’re able to keep the best managed, and we’re also able to make those projects the most sustainable. So I have the best confidence saying a lifetime from now, they’re gonna be working. Ryan: Well, I don’t think I’m humble, though. Rob: You don’t say that. Ryan: Ryan’s Well and the experiences, and the work we’ve been able to do, like, I’m immensely proud of it. But when I think people have a conception to say, “Oh, it’s because of you and all the work you’ve been able to do.” I don’t believe that for a second. Like, the only reason Ryan’s Well has been able to go forward is that I was able to share my vision, what I felt when I was a kid. And because of that, it’s not mine anymore, and when you look at Ryan’s Well, I’m lucky I’m still able to be an ambassador for the message and to tell my story. But why we are where we are is because people embrace that message that I was able to share. If I had just kept it to myself, maybe none of this would have ever come to be. So I think it’s the message that’s more powerful. Rob: Yeah, for sure, absolutely. That’s what I’m getting at here is, you said it, you know, it’s a small organization, but the message is powerful, and the fact that you’ve already influenced a million people with your organization is what’s so inspiring. So, in all of this that you’ve done, I mean, you’re 26 years old right now. You’ve done a lot in 26 years, and there’s still so much more to come, obviously. Your best is still in front of you like it is for all of us. What tips would you have for our listeners? I mean, we have people listening who stay at home and raise their children. Man, woman, it doesn’t matter. We have people who are CEOs of publicly traded firms. People in the Philippines, Australia, around the world, so what are some general tips that you might have from them and your experience that you can draw on and share? Ryan: I think the one really important thing is, I may have said, that you’re never too young to make a difference. It’s also important to remember that you’re never too old to make a difference. You know, we all come to the realizations with things that we connect to or we’re passionate about at different points in our lives. And I think, just when you find that thing, it could be anything. For me, I was lucky, I think, I found with clean water when I was a kid, and I’ve been able to volunteer and do things with it throughout my entire life. I think it’s important when you do find that thing, to not…do something small, raise your hand, and get involved and see where it leads. I think you owe it to yourself and you owe it to the cause you care about to do that. And I think the second thing I would probably say is, I guess, for me and my story, I may have said, you know, all these things about when I was a kid and people told me, “No,” and it was a little bit difficult in the beginning. When I was older, maybe 12, 13 years old, and the project was more successful, people started talking to me in a very different way than what they did. People started talking to me saying, “Good job for being an activist. Good job for being selfless. Good job being a role model for your peers,” and all these things. And that actually made me more uncomfortable than when people were saying no because I didn’t, I wasn’t any of those things, really. Like, with what we’ve been talking about, why we were able to do so much was because of so many people. And I think what’s important to realize is, you know, I used to look up to those people when I was a kid, you know, saints and, you know, selfless people, activists, who used to give their lives entirely to the causes they care about, and used to go out of their way immensely. And I envy those people. Those people exist and are out there and are amazing. But I’m not one of those people. Like, when I was a kid I liked getting to the weekend so I could go home and play video games with my brothers. And now that I’m older, I’m looking forward to the weekend so I could go play video games with my friends. You don’t have to give up enjoyment or give your life away. You look it as an experience to enhance your enjoyment, to enhance everything, and don’t take it as a negative, that you don’t have to give up everything you care about to do something for something else you care about. Like, it’s important to find balance and moderation for whatever your passion is, whether it be you could work or charity or whatever that thing is that speaks to you. Find time for it, and find time for yourself, as well. Rob: Well, and ironically, you just touched on the number one challenge that people consider, is…there was a big group that had been surveyed, and their number one challenge was how to prioritize their time. Sixty-eight percent of people say their number one challenge is how do they prioritize their time, stay focused on what matters most. And that is great advice because, sometimes, in my experiences and interactions with other people, I think, we’ve all felt this at some point, are you feeling like it’s an either-or proposition. Like, I’ve got to give up all of this to go do that. Whatever, you know, that might be. And that’s great advice because it doesn’t have to be that, does it, Ryan? I mean, you can take an incremental amount, you don’t have to devote your entire life to a certain cause, but simply by doing something, taking some small form of action can still ripple and have a big impact. Ryan: No, it’s incredibly important. I’m reminded…I was on this radio show, actually, it was called “CBC Radio,” and they were doing a special segment where they were interviewing volunteers. This is the Canadian Broadcasting Corporation, like. their radio program. And they were doing a special segment where they were interviewing volunteers of different generations. So they were interviewing someone who is was zero to nine, someone in their teens 20s, 30s, all the way up to someone in their 90s, actually. And I would have been the nine-year-old, and they would ask us all different things, and they did this round of interviews, like what motivated us and this and that, and when they were done the interviews, they found out something very curious. With the exception of myself and the teenager, every single other activist volunteer person that they interviewed at some point in their life had gone through a mental breakdown. Had gotten to the point where they’re doing so much that they couldn’t sustain a healthy lifestyle. So, I think, it’s really important to remember to, you know, keep track of your goal, keep honest with it, keep it as part of your life, but don’t let it consume you. Make sure you stay healthy and make sure that you’re making the right decisions for yourself. Rob: Yeah, amen. And if anybody’s listening to this, they are hopefully familiar with “roles and goals” and pre-week planning, and the power of looking at your life through the lens of different roles, setting up annual goals in each of those roles, and then doing the same with pre-week planning, which is, what are your roles and what matters most this week in each of those roles. And it’s a powerful process and tool to help maintain that balance that you’re talking about so you don’t burn out, which has happened to a lot of people. It’s a classic. What you just described on the activist side of the world is exactly what happens to many entrepreneurs, as well. Rob: They get so consumed and focused on building their business, their baby, that it becomes, that they get lopsided in their balance and sometimes there’s a crash or a breakdown that happens or, you know, what you described there. And it is preventable. It absolutely is by doing what you brought up, there. Well, Ryan, our time flies by. Thank you so much for being on the podcast. If there are people who want to learn more about what you’re doing at the Ryan’s Well Foundation, and I invite everyone to go check it out because it’s just amazing what Ryan’s done. Can you just briefly share with us your website and how anyone might be able to get in contact with you or at least just find out more about the foundation and what you’re doing? Ryan: Absolutely. Our website is ryanswell.ca. We’re also on Facebook, Twitter, and Instagram. It’s under Ryan’s Well for most of it, and, yeah, you might feel free to send me an email, or us a note, or let us know what you’re doing, or donate, or whatever it is. Let us know, ryanswell.ca. Rob: Fabulous. Well, Ryan, keep it up. You’re amazing, what you’re doing, and, like you said, you know, sometimes it’s the small things that make a big difference, and you’ve done a lot of those, and we just appreciate what you’re doing. Your story has been shared in a lot of places, and hopefully, that will be the catalyst to inspire others to do what they can. Even though, like, we’ve just talked about, it might be a small thing, the ripple can still be significant in the lives of different people. So, thank you so much for being here, Ryan, we appreciate you, and to all of our “Becoming Your Best.” Oh, go ahead, Ryan. Ryan: Good luck to everyone with becoming your best self. What you’re doing and spreading the word is incredibly important and best of luck to you and to all your listeners. 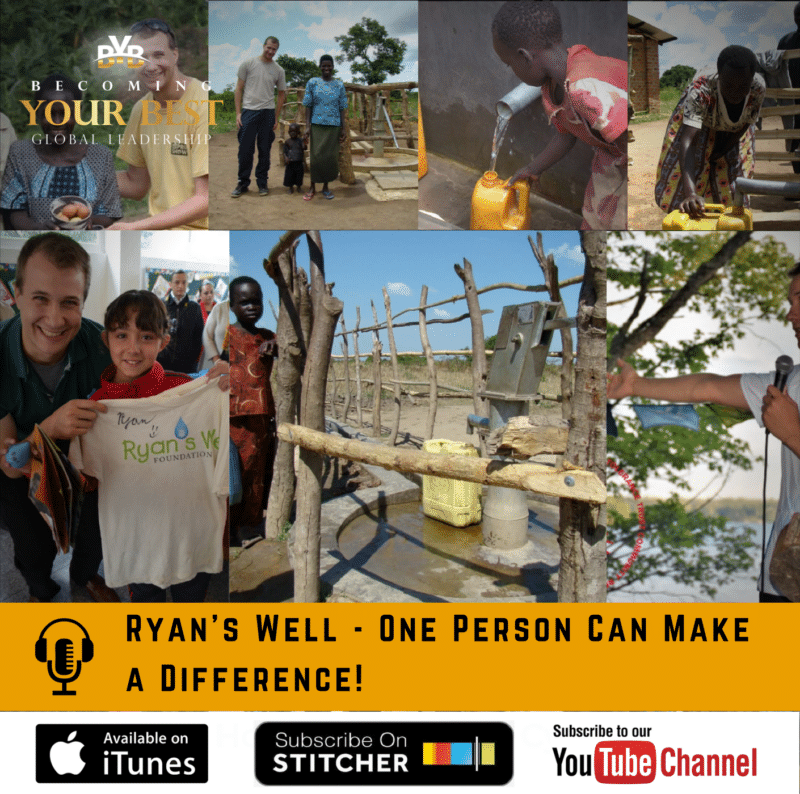 Rob: Well, thanks so much, Ryan, and to all of our listeners, hope you have a fabulous day, and Ryan reiterated this again, and that is that one person can make a difference. So let’s go out there and have a great week.